About a month ago the Uruguayan President, Dr Tabaré Vazquez visited Malaysia leading an important governmental and private sector delegation. The visit was a momentous one. It allowed Malaysia’s business people to have a direct look into the potential to develop the trade and investment links between the two countries and to build up the synergies that exist and can lead to generate more strategic partnerships based on their comparative advantages and strengths. MASSA played an important role during the visit. Trade and Investment between Malaysia and Uruguay is still relatively modest, but steadily increasing at interesting rates (over 44% in 2007). Trade amounts to about RM70 million both ways. It is also quite balanced. Uruguay exports to Malaysia beef, fish, leather, dairy products and imports electric and electronic goods and industrial machinery. If you look at these figures and at the sheer size of the country you might wonder: Why Uruguay? In most countries’ promotion strategies, there is a mention to the fact that they are a gateway to larger regions. In the case of Uruguay, I do believe that this is particularly accurate. Uruguay is geographically at the centre of a market inhabited by more than 260 million consumers, with the highest per capita income in the continent, and a combined GDP of USD1.3 trillion. 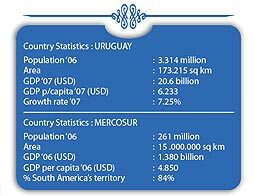 MERCOSUR has its best “gateway” in Uruguay, greatly enhanced by the conditions that the MERCOSUR agreement has created for the development of trade and business among the members of the block. Uruguay also has a bilateral free trade agreement with Mexico that gives tariff free access to 90% of all products and also includes services and investments. Easy access to that large market (especially to the core of business in the region, situated in a 1.500 km radius area, and to other regions and countries in the world is assured by an extensive and varied communications network, together with strongly competitive financial and business support services. Uruguay qualifies as an ideal platform from where business opportunities are launched to the region and the world. This is particularly true when it comes to logistics. Uruguay has about 1.5% of MERCOSUR’s GDP, but through its ports it mobilises over 6% of the containers traffic. It is interesting to note that Central Warehousing Corporation of India has recently acquired space at the containers terminal of the Port of Montevideo in order to serve as a logistics centre for Indian exporters to the MERCOSUR region. Uruguay makes no discrimination between local and foreign investments. No previous registration or authorisation required. No restrictions on capital or profit repatriation. Remittance can be made in any currency at any time. No limits on foreign capital share in companies. There is a liberal tax exemptions regime for investment projects. In addition, investments can be located in Free Trade Zones exempted from capital and income tax, as well as from any other tax created (as from 1987) or to be created in the future. Montevideo is the first and only free port of the Atlantic Coast of South America. 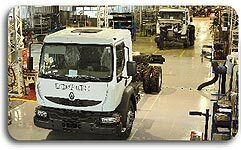 Free merchandise transit, no authorisations or formal procedures required. Within port facilities, goods are exempted from all import levies. Recent reforms to the tax regime included among other measures a reduction of corporate income tax: from 30% to 25%; incentives to reinvest: up to 40% of the net fiscal rent; lengthening of the prescription terms of fiscal losses: from 3 to 5 tax years; fiscal exemptions of rents related to R&D, biotechnology and software for export. The regulatory framework includes newly adopted legislation in Competition Law, Credit Guarantee Fund, Protection Of Property Rights and Bankruptcy Law. After the deep financial crisis of the River Plate (comparable to the Southeast Asia crisis of 1998), the country retook a growth path at “Asian” rates: 2.5% in 2003, 12.3% in 2004; 6.6% in 2005; 7.0% in 2006 and 7.25% in 2007. According to conservative expectations, growth for 2008 is forecasted at a minimum of 5%. All sectors of the economy are performing well, with all components of the demand growing. Investments as a percentage of GDP are recovering visibly, reaching 16%. FDI attained USD1.6 billion in 2007. Both imports and exports are experiencing double digit growth consistently over the last five years, reaching record heights. Education and good social indicators have traditionally been Uruguay’s strong competitive advantages. This is exemplified by the information technology sector’s consistent growth. These businesses have a sound professional base to undertake their activities. Within this sector, there is a highly qualified group of engineers, system analysts and programmers with technical abilities in integration with systems and in software product development. In addition to their skills, the professionals involved in this sector also have a good command of English as a second language. These skilled human resources are available at competitive salaries, i.e. 25% lower than in Argentina and 65% lower than in the USA. This has attracted a growing number of foreign companies such as: Tata Consultancy Services, Trinitech, Microsoft, IBM, Oracle, Bull, Unisys and Soluziona. Where Do We See Potential For Malaysian Firms? Manufacturing in the area of agribusiness, particularly foodstuff, plywood and the furniture industry (the country possesses about 1 million hectares of forestry plantations apt for both pulp and saw-mills), tourism (Uruguay received about 2.2 million tourists in 2006), logistics, construction, infrastructure, software development and electronics among others. State Visit of H.E. Dr Tabare Vazquez, President of the Oriental Republic of Uruguay to Malaysia and Vietnam. The President of Uruguay was accompanied by Mr Danilo Astori, Minister of Economy and Finances, Mr Enrique Rubio, Minister of Planning & Budget, Mr Herman Vergara, Governor of Lavalleja, Mr Artigas Barrios, Governor of Rocha and 21 delegation members from the government and private sector. In conjunction with this visit, NCCIM and the Embassy of the Oriental Republic of Uruguay in Malaysia organised the Malaysia-Uruguay Business Forum at the Sarawak Room, Shangri-la Hotel, Kuala Lumpur on 16 November 2007. On the same day, the Embassy of the Oriental Republic of Uruguay in Malaysia with the support of MASSA organised a Power Lunch for the President of Uruguay and delegation members with Malaysian business community at the Lemon Garden Terrace, Shangri-la Hotel, Kuala Lumpur. YBhg Tan Sri Dato’ Azman Hashim, President of MASSA addressed the invitees present at this Power Lunch which also included YB Mr Ng Lip Yong, Deputy Ministry of International Trade and Industry, Malaysia, Minister in Attendance, Hon. Datuk Dr Maximus Johnity Ongkili, Minister in the Prime Minister’s Department and H.E. Pablo Sader, Ambassador of Uruguay to Malaysia. 40 guests were present at this event.